Ferrari is among the world’s leading luxury brands most recognizable for its luxury performance sports cars. 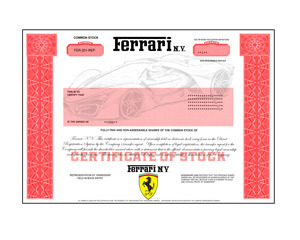 Ferrari does not issue paper stock certificates and registers ownership electronically instead. The recipient still becomes a real shareholder with all associated rights and will receive the cool, realistic-looking replica stock certificate shown.